Have you ever dreamed of playing golf among the ancient landscapes of Europe, so steeped in history that you can almost taste it? It’s September and the roads and hillsides of the Chianti region of Tuscany are lined with row upon row of grapes almost ready to harvest. Last night, we were in Greve celebrating the season and sampling wine and olive oil. Today I played my first round in Italy at the oldest golf club in the country. How cool is that? The growing number of British expatriates who were determined to bring their homeland sport to Italy founded Florence Golf Club in 1889. The original 8 holes were built in San Donato near Cascine Park which is now the Florence airport. In 1933 the club relocated to its current location and hired British architects Blandford and Gannon to design a new 18-hole layout. In the sixties Piero Mancinelli redesigned some of the holes but kept the same style and flavor. The first thing I noticed was that there are only two sets of tee blocks. Don’t be fooled by the fact that this par 72 only measures 5,672 meters (almost 6,200 yards). Ugolino is demanding because of the natural sloping tight fairways and very small well-protected greens, so it deserves a slope rating of 133. You’ll need thought more than strength to master this layout. The front nine swoops through hills and the key to these holes is to keep your tee shot in the fairway and back far enough so you can see the uphill greens. Shaping shots will definitely help your game but if you’d like a suggestion, keep your driver in the bag until you get to the 5th hole. The back nine is more level and offers better opportunities to charge the greens. The home hole sums up this historic course to a tee – a short 330-yard par four where a fairway wood or long iron is needed to be placed accurately in the fairway on this tight dogleg so that you are able to see the small, well-protected uphill green. What Ugolino lacks in distance is more than made up for by your ability to hit to a target on all shots. The new golf courses in North America condition us to pull out our driver on every hole except on a par three. Here you have to make an educated decision on every tee as to where you want to be to attack these postage stamp greens. 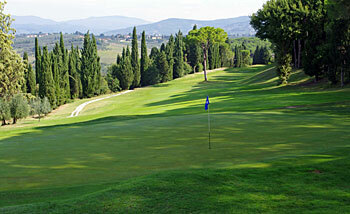 Florence Golf Club Ugolino is a private course with approximately 800 members but visitors are always welcome. Italy should be a must-do on everyone’s bucket list. The wine, the food, the people, the history, the architecture, the romance and now the golf! What are you waiting for? Come join us! Click the link to read Dave's complete story on Golf in Tuscany on his Golf Travel and Leisure website.